What a week for Connacht Rugby. Top of the league with four Pro 12 games remaining, Connacht have had precious little time to celebrate a momentous victory over Leinster as they head to Belfast to face Ulster this evening. Yes, they slayed one big Leinster Lion in the Sportsground in Saturday, showing real fortitude to withstand a final Leinster surge. And, when reclaiming possession in the final nail-biting minutes, they kept ball in hand until replacement Caolan Blade sent the ball dead, prompting triumphal celebrations from the capacity 7,300 crowd. Connacht had beaten Leinster 10-9 last season, but this result was altogether different. Never in Connacht's history had they faced their more illustrious provincial neighbours in a top-of-the-table clash with Champions Cup at stake. That Connacht prevailed by 7-6 having dominated the second half with confident ball handling was testament to their maturing skills and mental strength. “Leinster rolled out some massive, massive individuals, and they were desperate to get the points," said Connacht coach Pat Lam. "And for our boys to win that as a team is tremendous. There’s a lot of work that all of us coaches do. Kieron [Marmion] got the try, fantastic work, but there’s a lot of effort gone into it." 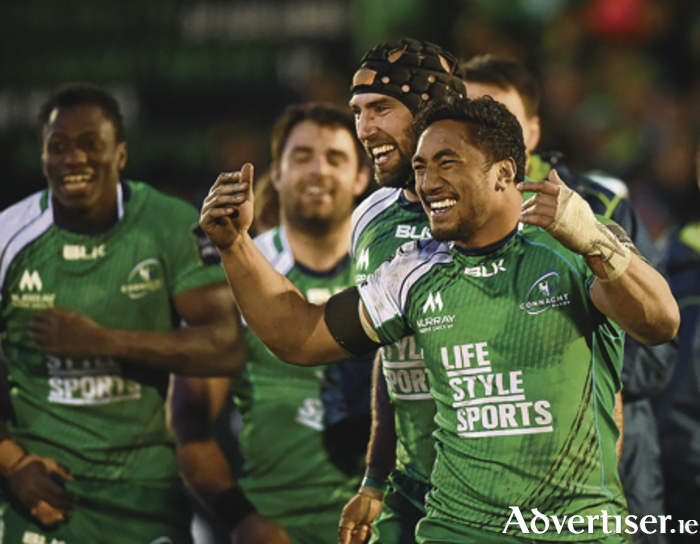 Connacht scored the game's only try on 13 minutes when scrumhalf Marmion beat Luke Fitzgerald to Niyi Adeolokun's kick ahead. Outhalf Aj MacGinty's conversion with the strong wind at his back put Connacht into a 7-0 lead. It was not until the second half that Leinster struck - opening with an Ian Madigan penalty. By the 62nd minute and with another Madigan penalty, Leo Cullen introduced his heavyweight bench hoping it would swing the game at the end. However it never materialised as Connacht took control, confidently keeping ball in hand, clearing out rucks, and frustrating their opponents. It ensured Connacht stayed top of the table with 63 points- four ahead of second-place Leinster. Although they both have 13 wins, as do Scarlets, Connacht's superior try bonus points - seven in all - has made the difference. “It was a big win, but as John [Muldoon] said afterwards in the changing-room, there’s no point in winning this if we lose against Ulster. The interpros mean a lot to the boys, and the one team we haven’t beaten since I’ve been here is Ulster, so it's a big week. It was emotional afterwards because you have to celebrate the victory and the work that was put in, but by the time we got back to the changing rooms, it was pretty much feet on the ground and the six-day turnaround for Ulster. Now it is a lot more around mental preparation, clarity, a lot less physical" said Lam. Ulster will be a huge ask. Hurting after a loss to Glasgow, Ulster's hopes for another semi-final are on the line. And Ulster and Glasgow are the only two Connacht have not beaten during Pat Lam's tenure. "I think the big one is understanding how we can beat them. We have played them five times, a couple of close ones, a hiding one year with 14 penalties to nil against us - I think a world record - and we were unlucky last year up there. So it's just preparing well and understanding what is coming, but it is nothing that should faze our guys - a massive challenge but one that if we prepare well mentally we give ourselves a good chance. They are a harder team to beat up there, we know that because we haven't done it. That makes the challenge tougher, but also more exciting. Connacht head to Kingspan Stadium knowing it has been 55 years since the province won in Belfast, but they have suffered yet another key injury with departing outhalf AJ MacGinty ruled out for a month. MacGinty, who had taken over the outhalf reins since Jack Carty ruptured his spleen, is now expected to be out of action for up to four weeks with a shoulder injury. And with Craig Ronaldson also sidelined, Lam will look to Eagles player Shane O'Leary with Academy player Conor McKeon on the bench. "Although the injury list is now low and we have good depth in some positions, having three 10s out is a bit of a killer blow, but that's life, you can't control the injuries," says Lam. "The number one thing is understanding the role of what needs to happen, and for the next person to do the job. A lot of the backs can play in more than one position, it's the beauty of our game. Of course we would like to have Jack, Aj and Craig Ronaldson available, but you can't cry over it, you've just got to move on and next person puts the jersey on and steps into the role." Jack Carty is due for a surgeon's review in two weeks in the hopes of starting a graduating contact training plan. Other injury worries for Lam are Nathan White, who is undergoing return to play protocols after being concussed in the opening five minutes in Connacht's 7-6 victory over Leinster, while Jack Heenan, a withdrawal following the captain's run with an ankle injury, continues to be monitored. However one piece of good news is the availability of Ireland lock Ultan Dillane. A defeat in Belfast would not be a set-back, but a victory would be another milestone achieved in Connacht's 2016 Odyssey.